Quality Service | Haven Fire & Safety L.L.C. 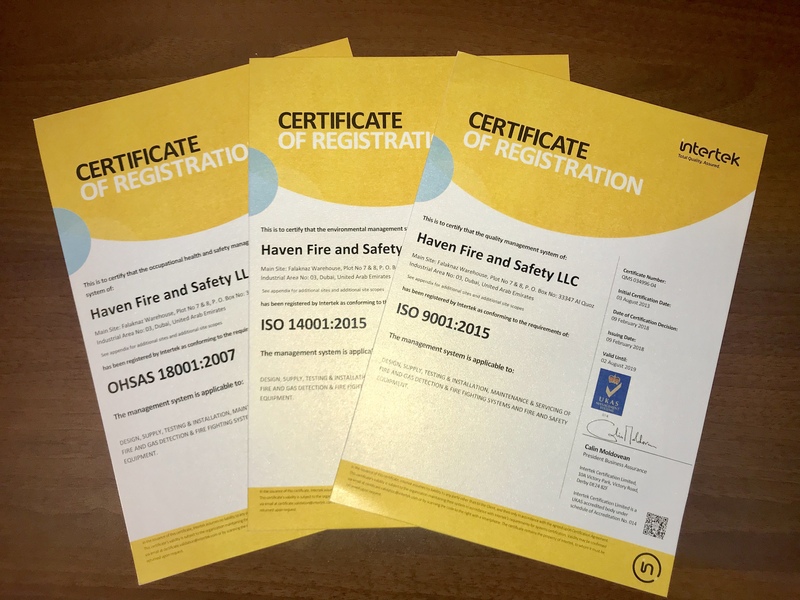 Haven Fire and Safety operate an ISO 9001-2015, ISO 14001:2015 and OHSAS 18001:2007 certified management system and are committed to providing the highest level of quality and services to our Clients. To maintain the highest standards of workmanship which consistently satisfy or exceeds the requirements of client, and to consistently deliver the highest level of services in a timely and cost effective manner. To assess and improve client perception with regard to HAVEN FIRE & SAFETY’s service levels. To innovate advanced methods of design, supply, installations and commissioning of the fire suppression systems, whilst ensuring safe system of work with minimal impact to the environment. To provide continual staff and employee training in order to ensure personnel development, with particular emphasis on matters concerning Quality, Health Safety and Environment. To invest in plant and equipment, information technology and information security based upon technological developments. To continually monitor specific objectives that have been set to maintain the standards for acceptable behavior and business practices. In particular, objectives have been set to achieve reductions in nonconformities, improvements in customer satisfaction levels in process performance levels, and supplier and sub-contractor performance and in prevention of injury and ill health. To meet the requirements of the International Standards ISO 9001 (Quality Management), ISO 14001 (Environmental Management) and OHSAS 18001 (Occupational Health and Safety) including compliance with legislation, other relevant requirements and commitment for the prevention of pollution. Top management shall ensure that QHSE objectives, including those needed to meet requirements for product are established at relevant functions and levels within the organization. The QHSE objectives shall be measurable and consistent with the QHSE policy. To review the policy and procedures periodically to ensure its relevance to company’s vision and communicate any changes to all employees. Committed to satisfy all applicable legal and other requirements, continual improvement through process approach and risk based thinking.